This report examines how and why shoppers in markets in Asia-Pacific, Europe, Latin America and North America buy on foreign ecommerce sites. Cross-border ecommerce continues to grow, as more of the world’s population become digital buyers, and retailers become better able to facilitate these transactions. In 2016, Forrester Research forecast that worldwide business-to-consumer (B2C) cross-border ecommerce would reach $424 billion by 2021, making up 15% of all online commerce. An October 2016 survey of global online shoppers by Ipsos and PayPal found that China was the No. 1 cross-border online shopping destination, cited by 21% of respondents, followed by the US (17%) and the UK (13%). Clothing was by far the most popular category purchased worldwide (46%), followed by consumer electronics (29%). 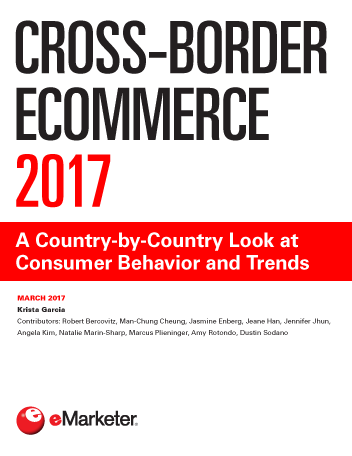 "A majority (65.5%) of retailer professionals worldwide considered cross-border ecommerce to be profitable in 2016, but this was down from 70% a year earlier."